CONTEXT: Childbearing women are the second victims for significant gestational weight retention and weight gain during reproductive years. There may be unique reasons to weight management in this period. AIM: To explore what women perceive as reasons for their excessive gestational weight retention and weight gain in the postpartum period. METHODS: By purposive sampling, n = 200 low-risk postnatal women less than a year of postpartum were recruited and their perceived reasons for excessive gestational weight retention and weight gain in the postpartum period were assessed. RESULTS: Participants perceived lowered physical activity, sedentary lifestyle behavior, lack of knowledge, misconceptions that breastfeeding automatically leads to weight loss, and high caloric intake as the reasons for gestational weight retention and gain in the postpartum period. Misconceptions that weight gain is predetermined by genetic factors, lack of support, and use of eating for physical and psychological comfort were also claimed as reasons for weight gain in the postpartum period. CONCLUSION: Reproductive health professionals should devise preventive measures to raise awareness on risks associated with unhealthy gestational weight retention and weight gain among average, overweight, and obese women in the postpartum period. Childbearing women are the second victims of a significant weight gain during reproductive years. The gestational weight retention and weight gain in the postpartum period may primarily contribute to the development of overweight and obesity in midlife and postmenopausal period. Overweight and obesity is a global public health problem and a major risk factor for type 2 diabetes, dyslipidemia, and cardiovascular diseases. With nutritional transitions, physical exercises, and behavioral lifestyle modifications, epidemiological evidence suggests that only 20% of obese patients achieve a significant risk-reducing weight loss by <10%., The development of obesity in women during postpartum life cycle, midlife, and the postmenopausal period has strong linear relationship to weight gain before and during pregnancy. A prospective study found that women who are already overweight or obese before conception have substantial risk to retain or gain excessive weight in the postpartum stage than average weight women. Obesity being a complex, multifactorial disease, with biological, behavioral, socioeconomic, and environmental origins, it raises risk of debilitating morbidity and mortality. Evidence from longitudinal and prospective epidemiological studies shows that certain maternal characteristics including age at menarche <12 years, interval between menarche and first childbirth <8 years, first childbirth between 24 and 30 years of maternal age, and sleep duration <5 h over 24 h at 6 months of postpartum are independently associated with a twofold to threefold higher risk of becoming overweight in the puerperal period., Being overweight and obese before a first conception has important implications for long-term persistent weight changes. Most studies that have examined the independent relationship of pregravid body size, gestational weight gain, and parity to postpartum weight retention yield conflicting results. 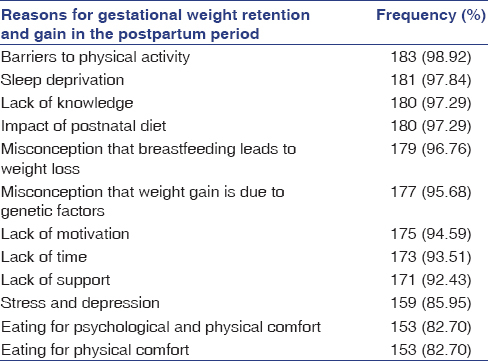 Average postpartum weight retention ranges from 0.5 to 3 kg among different populations. Nevertheless, the variability in postpartum weight change is large; a gestational weight gain cohort study indicated that approximately 20% of women had retained a minimum of 5 kg or more of gestational weight during 1 year of postpartum period. India has more than 30 million obese people, and more than 23% of the women are either overweight or obese and the number is increasing alarmingly. Although obesity is a preventable disease, only one-tenth of them achieve a significant weight loss with noninvasive interventions, including diet, physical exercises, and behavioral lifestyle modifications. Although the scientific literature about this subject is growing, what women perceive as reasons for their gestational weight retention, excessive weight gain, and their inability to lose weight postpartum, is not yet explored in Indian population. To date, no research studies have been carried out on the opinion of women on excessive gestational weight retention in the postpartum period in India. The objectives of this study were to explore what obese puerperal women perceive as reasons for their excessive weight retention and gain in the postpartum period. At a practical level, understanding the holistic perception of women would address the barriers to healthy weight management and move us forward in devising primary preventive strategies to optimize healthy weight management. Following the approval of this cross-sectional study protocol by ethical committee, medical and nursing superintendents of the three private maternity hospitals Bangalore, South Karnataka, participants were recruited during March 2017 to January 2018. Purposive sampling was used to select women from diversified culture with different needs and views to explore their perceptions on various reasons for postpartum gestational weight retention and gain. Low-risk postpartum women during the 1st year of postpartum, with BMI of >25 kg/m2, were included. Women with any associated medical, surgical, gynecological, and psychological risk factors were excluded. Individual interview was carried out by a medical social worker in privacy since overweight and obesity is perceived as a sensitive subject and often involves social stigmatization and poor self-esteem. No problems were encountered while recruiting them to participate in the study. This study follows the ethical regulations and conforms to the Declaration of Helsinki. For a significance level of 5%, a statistical power of 80%, and a minimum effect size of 0.5, the minimum sample size calculated was 168 postpartum women. Taking into consideration of missing data and noncompliance by 20%, n = 200 women were recruited. Statistical analyses were performed using IBM SPSS Statistics (Version 21.0. Armonk, NY: IBM Corp, USA). Descriptive statistics – frequencies and percentage – were performed on all items and nonparametric Chi-square/Fisher's exact probability tests were used to find the association of perceived reasons with sociodemographic variables. An alpha of <0.05 was considered significant in all tests. The semi-structured interview was validated by the maternal and child health experts and the content validation index was 0.88. The test and retest stability reliability of the tool by correlation coefficient among n = 28 pilot tested women yielded r = 0.89. Of the n = 200 postnatal women who agreed to participate in the study, n = 15 of them were excluded from the study as n = 6 of them withdrew from the study due to time constraints and n = 9 had missing values. Final analyses consisted of n = 185 postpartum women in less than a year of postpartum with BMI >25 kg/m2 [Table 1] and [Figure 1]. The participants were between 23 and 37 years old, with a mean age of 25.2 ± 5.13 years. The postpartum period of the participants ranged from 1 to 11 months with a mean postpartum period of 5 ± 2.2 months. With regard to educational status, majority of them (94.3%) were graduates and postgraduates and the rest (5.7%) had their technical and allied health education. Majorities (97.4%) of them were employed and returned to work after 3–6 months of their postpartum period. Regarding socioeconomic class, 96.8% were from middle and upper-middle socioeconomic background (Class 1–III) and a few 3.2% belonged to lower-middle class and lower class (Class IV–V) as per the modified BG Prasad's Classification, 2018. Majority (98.92%) of the participants reported that lack of physical activity in the puerperal period could have contributed to gestational weight retention and gain in the postpartum period. Most of them claimed that pain tiredness, lack of sleep, lack of time, lack of support, cold weather, high demands of the infant, and mood swings were the main barriers to physical activity in the postpartum period. Nevertheless, most women who interviewed perceived that the traditions, cultural beliefs, and the significant others advice on rest in the postpartum resulted in lowered physical activity level and excessive weight gain. Most of the women (98.38%) did not make any attempts to adjust their caloric intake to their lowered physical activity level. Approximately (97.84%) of the women expressed that they slept <6 h due to nighttime breastfeeding demands, high-needs of the infants, and little nighttime support from significant others. Most of them (97.29%) felt overwhelmed, exhausted, due to sleep deprivation, and the demands of a newborn, and thus, eating was the only option for them to overcome the stress. Approximately 85.95% of the women felt that postpartum period was extremely a stressful time loaded with enormous responsibilities coupled with newborn care and family responsibilities. Several postnatal women (97.29%) who interviewed were ignorant about the weight recommendations and weight management in pregnancy and postpartum. Most of them (98%) claimed that they were not aware of the adverse impact of overweight and obesity on maternal and neonatal outcomes. Only 40.54% of the women knew that excessive weight gain during pregnancy could lead to the risks of developing diabetes mellitus, hypertension, and cardiovascular diseases. None of them reported that gestational weight retention and postpartum weight gain would predispose them to future development of obesity. Approximately 94.59% of the women reported that they did not receive any constructive advice about weight gain in pregnancy and weight management during pre- and post-partum period from health-care providers. Furthermore, 97.3% did not receive any advice about physical activity from health-care providers during the 1 year of postpartum period, missing a crucial opportunity to influence weight retention in the long term. A vast majority of the postnatal women (97.29%) stated that they generally consume increased quantity of food during lactation than they usually do, including during pregnancy. The quantity of foods consumed was perceived to be associated with the amount of milk produced. Nearly 98.92% women correlated the quantity and quality of foods consumed in the postpartum period with improved milk quality, production, and the well-being of both mother and child. Mothers consciously tried to increase the caloric intake during lactation and favored high palatable, energy-loaded food substances that increased the quality and quantity of breast milk. Nearly 96.76% of mothers in this study believed that breastfeeding automatically leads to substantial weight loss in the postpartum period and lactating mothers should eat more without any concern while breastfeeding. Most of them (95%) expressed that this reliance on breastfeeding for automatic weight loss was reinforced by significant others; media and health-care providers which gave them a false promise of easy postpartum weight loss that lowered their motivation to limit their weight gain or eat healthy during postpartum. Most of the women (95.68%) believed that weight gain was related to familial or genetic factors. Majority of them (98%) stated that because their mothers and sisters were overweight and they also would gain weight and become obese. They believed that the weight pattern is controlled by hereditary factors and therefore less controllable which negatively affected the women's motivation to actively try to control their weight. Several women (93.51%) reported that high needs of the infants, family responsibilities, and lack of support limited their time to join any weight management program. 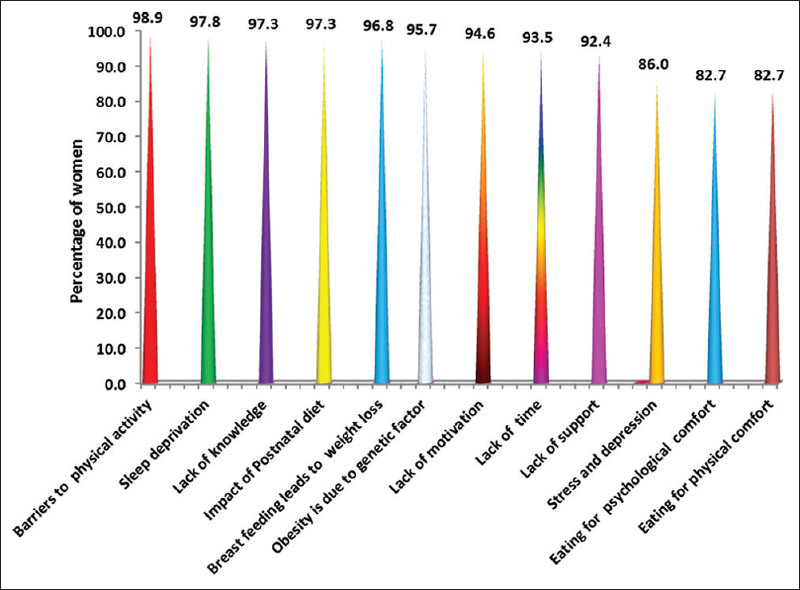 They also mentioned that they lacked self-motivation (94.59%) due to tiredness (96%) and demands of the infant (94%). In addition, several women (98.92%) expressed that they have never received any advice from the health-care personnel on effective weight management in the postpartum period which could have augmented their weight gain. Most of them (98.92%) expressed their desire to get more support and encouragement from partner, family members, and medical personnel for weight loss and postpartum exercises for effective weight management in the puerperal period. Majority of the women (82%) stated that they consumed highly palatable foods to relieve psychological and physical discomfort, including pain, hunger, tiredness, sleeplessness, tension, frustration, anxiety, depression, stress, boredom, and restlessness. These physical and psychological factors served as a mediator for excessive weight gain and gestational weight retention. Women reported that they were often painfully aware of their unhealthy eating behaviors but felt compelled to eat due to a lack of support from the health-care providers, family, and healthier coping strategies. Chi-square/Fisher's exact probability test revealed an insignificant association of maternal characteristics such as age (χ2 = 2.413; P = 0.461), parity (χ2 = 2.043; P = 0.139), employment status (χ2 = 1.023; P = 0.417), and BMI (χ2 = 1.051; P = 0.627) with their perceived reasons for gestational weight retention and gain. Puerperal weight retention has important public health implications as it has a significant impact on long-term obesity and associated health risks among women. The postpartum period is potentially a critical time for the development of obesity and a vulnerable time for gestational weight retention and gain. Regular physical activity is a potentially modifiable healthy lifestyle behavior associated with adequate postpartum weight loss to overcome gestational weight gain and retention. In this study, almost all (98.92%) the postpartum women reported that they engaged in very little vigorous-intensity activity and face numerous barriers to physical activity, including pain, tiredness, mothering responsibilities, lack of time, not prioritizing health over other competing responsibilities, lack of partner support, childcare, social isolation, family responsibilities, financial, neighborhood safety, and cold weather. In addition, the traditional and cultural beliefs on the postpartum rest segmented their physical inactivity. Another modifiable factor reported by them was their sedentary lifestyle behavior, deleterious health lifestyle behaviors that involve little physical movement, and low levels of energy expenditure, which contributed to overweight. Health-care personnel should address these physical activity barriers in the prenatal period to assist women to maintain healthy weight. The postpartum period is a challenging and stressful time for women, and most of them feel overwhelmed, exhausted, due to sleep deprivation, hormonal changes, high demands of infant lack of time, space for themselves, and adaptation to mothering role twined with family responsibilities. In addition to adapting to maternal role changes, many mothers may experience a variety of emotional changes such as transient postpartum blues, depressive symptoms related to situational factors, and postpartum depression. Literature report that depression in the postnatal period is associated with more than a twofold increased risk of substantial weight retention at the end of the 1st postpartum year. The association between depression and obesity is complex, and debate exists about its direction of causal relationship. However, a prospective study by Goodman and Whitaker has revealed evidence of a causal pathway in which depression increased a significant postnatal weight gain and weight retention in women. Depression may also act as a barrier to weight loss in overweight women. A study that investigated the effect of weight loss treatment among overweight women in a large managed care organization by Linde et al. reported that women with depressive symptoms lost less than half as much weight as women without depression. Our study extends such research to women after childbirth and suggests that depression in the postpartum period may be a barrier to returning to prepregnancy weight. The need for identifying potentially modifiable determinants of postpartum weight retention is crucial. Excess weight retained in the puerperal period appears to be more physiologically harmful than weight gained at other times in life. This weight is deposited preferentially in central rather than peripheral sites leads to long-term reductions in high-density lipoprotein cholesterol and is associated with adverse reproductive outcomes in subsequent pregnancies. If evidence from well-designed studies confirms that depression is the precursor for postpartum weight retention, newer interventions should be tested before obesity develops in the puerperal period. There is a strong notion among women that breastfeeding favors substantial weight reduction and lactating women should eat more, which were reinforced by elders, deep-rooted traditions, cultural beliefs, customs and social interactions, friends, and media. It has been estimated that lactating women lose around 0.6 and 0.8 kg/month in the first 6 postpartum months, but the available evidence reports inconsistent results on the linear association between breastfeeding and postpartum weight loss. Although few researchers have reported that breastfeeding promotes weight loss depending on the duration of breastfeeding and maternal nutritional transition, most studies do not support the concept that breastfeeding augments postpartum weight loss., This widely held belief that lactating would automatically lead to gradual weight loss in the postpartum period should be addressed by the health personnel, and more studies are needed to evaluate the impact of lactation on postnatal weight management. Failure to lose pregnancy-related weight is an important contributor to long-term obesity and related serious chronic conditions among women. In this study, several women were ignorant of the expected weight gain during pregnancy and the adverse effects of excessive gestational weight gain on perinatal outcomes and postpartum weight retention. Most of the participants expressed that gestational weight gain reveals that the baby is in good health and it is a positive sign that the baby is growing normally. Majority of them had conceptualized that unrestricted maternal nutrition in prenatal period would result in a healthy baby. Catherin et al. reported similar findings that most of the prenatal women agreed that increased quantity of food and number of meals are of prime importance during the pregnancy to ensure growth of the child and to provide energy for the mother during labor process. Many of the participants expressed that they had not received either advice or health education on required weight gain and its impact on health from the health personnel. A well-designed qualitative emergent research study reported similar findings that all of the participants were totally unaware of the recommended during weight gain in pregnancy, its impact on perinatal outcomes, or future obesity with excessive weight gain and postpartum weight retention. Furthermore, the study highlighted that medical staff had not emphasized on weight development, postpartum weight retention, and its related risks on reproductive outcome. The possible explanation for the poor knowledge of women could be related to lack of advice on nutrition and weight recommendations and its adverse effects on health from the reproductive health personnel. Obstetric health-care personnel should counsel pregnant and postpartum patients on specific weight-related behaviors. A cross-sectional study revealed that only 38% of the health-care providers counsel pregnant and postpartum patients on all weight-related behaviors. The researcher argued that reproductive health-care providers should be subjected to special training on healthy lifestyle behaviors to increase their self-efficacy to counsel pregnant and postpartum women on weight management. Majority of the women reported that postnatal diet and healthy nutrition in the puerperal period could be the causative factor for postpartum weight retention. In India, postpartum period is given much emphasis for the mother to recover from childbirth and diet constitutes the main aspect of postnatal care. Women are encouraged to eat frequent meals with clarified butter to enhance bowel movement, digestion, and promotion of breastfeeding. This unrestricted intake of saturated fat, frequency of meals, and minimal physical activity were perceived as main contributing factors for the postpartum weight retention. Consistent findings were reported by Rao et al. that without compromising cultural beliefs and ideological integrity, postnatal women were encouraged to eat as much as they wanted of rice, fish (dried and wet), crackers, cakes, spices, varieties of wild vegetables, milk, and eggs. In this study, most of the women reported that they had not had any health education either in-depth or regular form about weight gain during pregnancy and its impact on postnatal weight retention and gain from the reproductive health personnel, but that they would like to. In addition, they preferred to be educated by the health personnel on effective weight management measures to overcome the risk of obesity and its impact on their health and health of the baby as they are the more trusted and reliable source of information during childbearing period. Our results support and extend the results from the qualitative study that used mixed methods to explore knowledge, beliefs, and practices of n = 26 postpartum women in Alberta related to nutrition, physical activity, and weight in pregnancy. The study reported that women prefer to have discussions on healthy eating, lifestyle behaviors, and recommended weight gain and measures to overcome the overweight and its effects on reproductive outcomes. A focus group discussion with n = 24 postpartum women in the USA reported consistent findings that women had not had any type of discussions with health-care providers on healthy weight gain and healthy behaviors that could assist them to overcome obesity in the postpartum period. The researcher also reported that women look to their health-care practitioners for direction about health, eating, and appropriate weight gain. Bianchi et al. reported similar findings that women wanted their health personnel to learn about a woman's lifestyle, health behaviors, beliefs, and level of motivation so that they could assist them in targeted and supportive ways. Evidence from well-designed studies reports that chronic partial sleep loss is associated with an increase in the risk of obesity. Laboratory studies show that sleep restriction leads to hormonal alterations, which may favor an increase in calories intake and a decreased energy expenditure and ultimately lead to weight gain. In this study, 97.89% of the women reported that they sleep <6 h over 24 h due to high demands placed by the infant. In addition, they claimed that they eat highly palatable snacks to overcome their poor quality of sleep and hunger which could have contributed to their weight gain. Numerous epidemiological studies conducted in different geographical regions that examined the association between sleep and obesity in adults and children found a significant association between shorter duration of sleep <6 h per night and increased risk of obesity risk. A meta-analysis of 18 studies in 604,509 adults demonstrated a pooled obesity odds ratio of 1.55 (1.43–1.68; P < 0.0001) for <5 h of sleep and a dose effect of sleep duration such that for each additional hour of sleep BMI decreased by 0.35 kg/m2., Brondel et al., who investigated the association between sleep deprivation and eating behavior, reported an increased caloric intake and hunger after 4 h of night sleep in 12 normal weight young adults. Gestational weight retention and gain in postpartum period is an important risk factor for overweight and obese adults in general and in the context of weight management interventions. Researchers and reproductive health personnel should acknowledge the vulnerable nature of this population. Findings call for the implementation of weight management interventions targeted to average, overweight, and obese women who have excessive gestational weight retention and gain during the postpartum period to promote weight loss. The study findings cannot be interpreted as a causal relationship to excessive gestational weight retention and weight gain among women in the postpartum period. The findings of the study highlighted that postnatal women perceive lowered physical activity, sedentary lifestyle behavior, lack of knowledge, misconceptions, high caloric intake, the use of eating for physical and psychological comfort, and lack of support as reasons for their excessive gestational weight retention and gain. Obstetric health-care personnel should identify women who are susceptible to substantial postpartum weight retention, to becoming obese, or to increased central adiposity after pregnancy. These women may require subsequent evaluation for primary prevention of midlife obesity and chronic diseases. Health-care providers should be aware of normal postpartum weight loss patterns, as well as risk factors for gestational weight retention, to assist the women in achieving a healthy postpartum weight. More intensive interventions are needed to help overweight and obese women integrate physical activity and reduce sedentary lifestyle after the birth of a baby. We are grateful to all the participants, medical social workers, and medical and nursing superintendents, nurse midwives of the study setting, and biostatistician for their support and cooperation. Gunderson EP. Childbearing and obesity in women: Weight before, during, and after pregnancy. Obstet Gynecol Clin North Am 2009;36:317-32, ix. Hruby A, Hu FB. The epidemiology of obesity: A big picture. Pharmacoeconomics 2015;33:673-89. Torgerson JS, Hauptman J, Boldrin MN, Sjöström L. XENical in the prevention of diabetes in obese subjects (XENDOS) study: A randomized study of orlistat as an adjunct to lifestyle changes for the prevention of type 2 diabetes in obese patients. Diabetes Care 2004;27:155-61. Rosenberg L, Palmer JR, Wise LA, Horton NJ, Kumanyika SK, Adams-Campbell LL, et al. Aprospective study of the effect of childbearing on weight gain in African-American women. Obes Res 2003;11:1526-35. Linné Y, Dye L, Barkeling B, Rössner S. Weight development over time in parous women – The SPAWN study–15 years follow-up. Int J Obes Relat Metab Disord 2003;27:1516-22. Ashley-Martin J, Woolcott C. Gestational weight gain and postpartum weight retention in a cohort of Nova Scotian women. Matern Child Health J 2014;18:1927-35. Rooney BL, Schauberger CW, Mathiason MA. Impact of perinatal weight change on long-term obesity and obesity-related illnesses. Obstet Gynecol 2005;106:1349-56. Gunderson EP, Abrams B, Selvin S. The relative importance of gestational gain and maternal characteristics associated with the risk of becoming overweight after pregnancy. Int J Obes Relat Metab Disord 2000;24:1660-8. Gouda J, Prusty RK. Overweight and obesity among women by economic stratum in urban India. J Health Popul Nutr 2014;32:79-88. Amorim AR, Linne YM, Lourenco PM. Diet or exercise, or both, for weight reduction in women after childbirth. Cochrane Database Syst Rev 2007;(3):CD005627. Osman H, Saliba M, Chaaya M, Naasan G. Interventions to reduce postpartum stress in first-time mothers: A randomized-controlled trial. BMC Womens Health 2014;14:125. Herring SJ, Rich-Edwards JW, Oken E, Rifas-Shiman SL, Kleinman KP, Gillman MW, et al. Association of postpartum depression with weight retention 1 year after childbirth. Obesity (Silver Spring) 2008;16:1296-301. Goodman E, Whitaker RC. A prospective study of the role of depression in the development and persistence of adolescent obesity. Pediatrics 2002;110:497-504. Linde JA, Jeffery RW, Levy RL, Sherwood NE, Utter J, Pronk NP, et al. Binge eating disorder, weight control self-efficacy, and depression in overweight men and women. Int J Obes Relat Metab Disord 2004;28:418-25. Gunderson EP, Murtaugh MA, Lewis CE, Quesenberry CP, West DS, Sidney S, et al. Excess gains in weight and waist circumference associated with childbearing: The coronary artery risk development in young adults study (CARDIA). Int J Obes Relat Metab Disord 2004;28:525-35. Gunderson EP, Lewis CE, Murtaugh MA, Quesenberry CP, Smith West D, Sidney S, et al. Long-term plasma lipid changes associated with a first birth: The coronary artery risk development in young adults study. Am J Epidemiol 2004;159:1028-39. Villamor E, Cnattingius S. Interpregnancy weight change and risk of adverse pregnancy outcomes: A population-based study. Lancet 2006;368:1164-70. Neville CE, McKinley MC, Holmes VA, Spence D, Woodside JV. The relationship between breastfeeding and postpartum weight change – A systematic review and critical evaluation. Int J Obes (Lond) 2014;38:577-90. Lipsky LM, Strawderman MS, Olson CM. Maternal weight change between 1 and 2 years postpartum: The importance of 1 year weight retention. Obesity (Silver Spring) 2012;20:1496-502. Jarlenski MP, Bennett WL, Bleich SN, Barry CL, Stuart EA. Effects of breastfeeding on postpartum weight loss among U.S. women. Prev Med 2014;69:146-50. Catherin N, Rock B, Roger V, Ankita C, Ashish G, Delwin P. Beliefs and practices regarding nutrition during pregnancy and lactation in a rural area in Karnataka, India: A qualitative study. Int J Community Med Public Health 2015;2:116-20. Christenson A, Johansson E, Reynisdottir S, Torgerson J, Hemmingsson E. Women's perceived reasons for their excessive postpartum weight retention: A Qualitative interview study. PLoS One 2016;11:e0167731. Boothe-LaRoche A, Belay B, Sharma AJ. Pregnancy and postpartum related weight counseling practices of U.S. obstetrician-gynecologists: Results from the doc styles survey, 2010. J Womens Health Care 2014;3:208. Rao CR, Dhanya SM, Ashok K, Niroop SB. Assessment of cultural beliefs and practices during the postnatal period in a coastal town of South India – A mixedmethod research study. 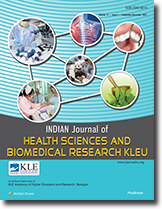 Global Journal of Medicine and Public Health (GJMEDPH) 2014;3:1-8. Available from: http://www.gjmedph.com/uploads/O3-Vo3No5.pdf. [Last accessed on 2018 Mar 20]. Nikolopoulos H, Mayan M, MacIsaac J, Miller T, Bell RC. Women's perceptions of discussions about gestational weight gain with health care providers during pregnancy and postpartum: A qualitative study. BMC Pregnancy Childbirth 2017;17:97. Stengel MR, Kraschnewski JL, Hwang SW, Kjerulff KH, Chuang CH. “What my doctor didn't tell me”: Examining health care provider advice to overweight and obese pregnant women on gestational weight gain and physical activity. Womens Health Issues 2012;22:e535-40. Bianchi CM, Huneau JF, Le Goff G, Verger EO, Mariotti F, Gurviez P, et al. Concerns, attitudes, beliefs and information seeking practices with respect to nutrition-related issues: A qualitative study in French pregnant women. BMC Pregnancy Childbirth 2016;16:306. Beccuti G, Pannain S. Sleep and obesity. Curr Opin Clin Nutr Metab Care 2011;14:402-12. Leproult R, Van Cauter E. Role of sleep and sleep loss in hormonal release and metabolism. Endocr Dev 2010;17:11-21. Cappuccio F, Miller M. The epidemiology of sleep and cardiovascular risk and disease. In: Cappuccio F, Miller M, Lockley S, editors. Sleep, Health and Society: From Aetiology to Public Health. Oxford: Oxford University Press; 2010. p. 83-110. Brondel L, Romer MA, Nougues PM, Touyarou P, Davenne D. Acute partial sleep deprivation increases food intake in healthy men. Am J Clin Nutr 2010;91:1550-9.